Martyn Underhill, PCC for Dorset, is now the fly-tipping lead for the National Rural Crime Network, but was unable to attend the meeting. He will however be taking this issue forward on behalf of the Network and spreading some of the best practice he has uncovered. He can be contacted on pcc@dorset.pnn.police.uk. The meeting itself was interesting, and there is very clearly a real desire to change and improve the response to fly-tipping, which is being pushed by DEFRA and the Secretary of State, Michael Gove. A formal DEFRA consultation on fly-tipping will follow in due course, with the basis of this meeting being for them to better understand the problem of fly-tipping on private land, of which the Network focussed on rural fly-tipping specifically. 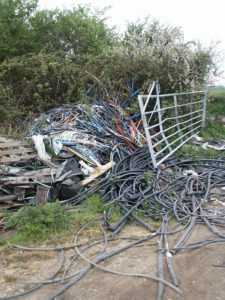 DEFRA’s understanding of fly-tipping on private land is very limited because data is not routinely collected, although questions were asked about whether it does sit within police forces and other partners should we look hard enough. Further to that, all partners around the table shared very similar concerns, largely around the public (through no fault of their own) not knowing who to report fly-tipping to, what steps to take next, and frustrations about a lack of action to prevent, deter and prosecute. On fly-tipping on public land, of the 1,000,000+ cases reported last year, 3,000 or so resulted in prosecution. It is assumed the rate of fly-tipping on private land has also gone up in each of the last seven years, although probably less prosecutions. DEFRA left that part of the meeting under no illusion of the concerns of those living and working in rural areas, as well as landowners. DEFRA took the ideas away and it is understood, as outlined above, a formal consultation will follow in an attempt to improve the response to fly-tipping.